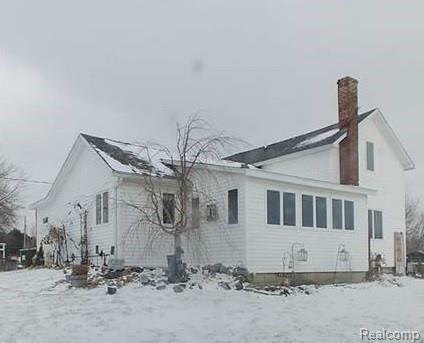 Spacious farmhouse has all the charm with 2017 and 2018 updates. Updates in house include large new bathroom and kitchen that is brand new complete with Granite countertops and stainless steel appliances. Relax in your own in ground pool surrounded by a large deck. Property features many outbuildings including large horse barn with 10 stalls, indoor wash rack with heated water, laundry facility in tack room; a small horse barn with 5 stalls including one foaling stall, 6 run in sheds in pastures and paddocks, and large chicken coup used as additional garage/workshop space. Property has 1/2 mile track in excellent condition with open riding area in infield. Extensive paddocks and pastures. This horse farm is ready to use for business or pleasure. Home built prior to 1900 and date unknown. Has Michigan Basement. Located only 5 miles from Swartz Creek. Easy access to I-69. Buyers to verify all information. All showings must be accompanied by a licensed Michigan Real Estate Agent.